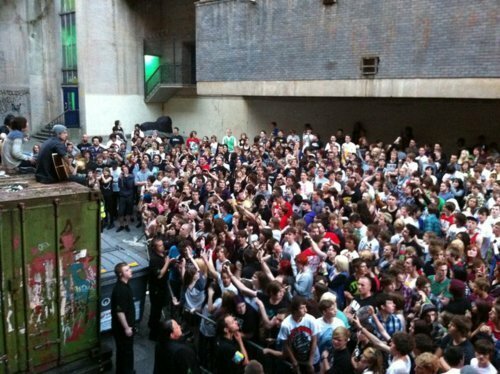 BMTH's Crowd At 02 Academy Bristol. "The power cut out at O2 Academy Bristol tonight before we had a chance to play our set. The entire building was evacuated so we decided to play an impromptu acoustic set outside on haut, retour au début of a shipping container in front of 1600 people!!" - Jona Weinhofen. Wallpaper and background images in the Bring Me The Horizon club tagged: bring me the horizon band crowd 02 academy bristol.